In this tutorial, I am going to show you the most popular and trending module in Spring Framework that is Spring Boot. By this tutorials you can get to know how to write a Simple Spring Boot Example. Here I am going to implement a basic hello world spring boot example. To make our example as simple as possible, I have placed dependencies in pom.xml what just I want. @SpringBootApplication annotation tells the spring application context, it is an spring boot application. Most of the developers can used to define the spring boot main classes with the @Configuration, @EnableAutoConfiguration and @ComponentScan annotations. Since these annotations are mandatory to every Spring application, the Spring Boot given us an annotation called @SpringBootApplication instead. On e of the biggest advantage of Spring boot application is, to run we don’t deploy the application in any server. 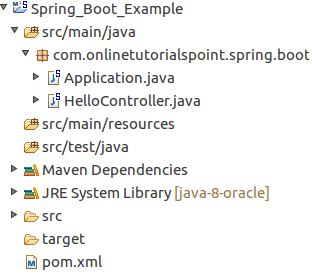 We can run the above spring boot example as a simple Java standalone application. Run the main method in Application.java. If every thing goes well, you can find the below text in your console. The Article is very Informative and Worth Reading For the Candidates like me. Currently, I am learning spring boot training and this Article is helpful for me to understand the things very easily. I really Appreciate your work, here you given a very informative post. As a beginner to SpingBoot technology, I found some new points, which is very much usefull for me. And thiss very much helpfull for every beginner.